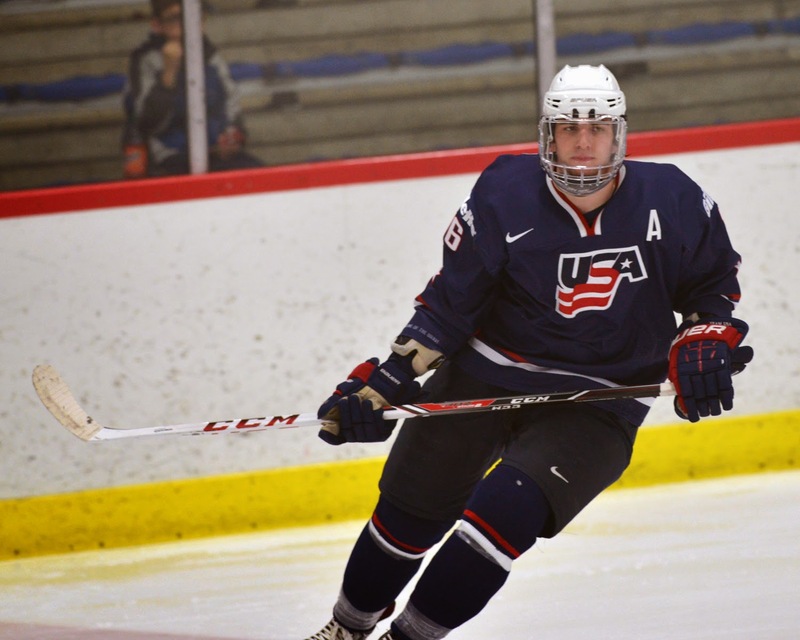 Terrier 2014 recruits Jack Eichel and Johnathan MacLeod (photo) provided the offense for Team USA’s 6-2 win against Slovakia in the quarterfinal round of the IIHF World U18 Championships. Eichel, who scored the game-winner against Finland in the final minute of regulation on Wednesday, got the Americans on the board just 54 seconds into the game, scoring from in close after a Slovak turnover. Just 2 ½ minutes later, MacLeod, took a pass from Eichel and scored on the power play to double the lead. Eichel picked up a second assist on Team USA’s third goal. After the Slovaks got on the board in the third period, MacLeod scored again on the power play, rifling home a one-timer. With three points, Eichel earned U.S. player of the game honors and increased his team leading point total to 85, which is now fourth best for a single NTDP season. His 48 assist are third most on the NTDP’s all-time list for one season. MacLeod’s pair of goals gives him a season total of 5, second most among NTDP defenseman. Team USA’s semifinal opponent is Sweden with puck drop on Saturday scheduled for 8 a.m. EDT. Fast Hockey will live stream the game for free. Charlie Coyle’s power-play backhander, his third goal of the playoffs, was the game-winner in Minnesota’s 2-1 win over Colorado, evening their series at two games apiece. Matt Nieto scored his second playoff goal, but Los Angeles escaped a sweep, doubling up the Sharks, 6-3. Nieto is one of two San Jose players with points in each playoff game. The NHLPA posted a 3-minute video of every Stanley Cup championship celebration since 1949. Can you spot the one showing a Terrier? Ed Ronan - 1993. He's in there very briefly.